The running joke with Saint Vitus’ 1986 record Born Too Late was that it confirmed what everyone already knew about the band. It’s like someone stumbled across a lost tribe of the Sons of Silence motorcycle club where downers was part of their food pyramid and the only music they had was an 8-track of Masters Of Reality that played on an endless loop. Life got mundane for these Earthmovers, so they picked up some instruments and proceeded to break down those Sabbath riffs into their most basic elements, slowing down the tempo until the entire thing sounds like it’s in death throes. There was no such thing as “doom metal” back then. Instead, Saint Vitus looked like an out-of-touch bunch of stoners who perfected a faithful reproduction of drop D horrorshow and blatant Sabbath worship. Their records–wonderfully out of place on the hugely influential SST label–all sounded like they were recorded on barely working studio equipment with anything above 10 kHz not even registering because of the primordial ooze of guitarist Dave Chandler selfishly taking over everything else in the mix with motor oil cans of fuzz. As you can probably guess, Saint Vitus were never appreciated as much as they should have been during their original tenure. By the time of their second decade, the fruits of their labors began to show in the work of their young admirers, but with Saint Vitus’ sonic quicksand being a decidedly acquired taste, they limped through changes in vocalists while remaining embedding in their underground status. It’s been seventeen years since their last album, Die Healing, a swan song featuring the band’s original vocalist Scott Reagers that seemed to end the band’s legacy on a high note. We’ve seen a reunion of the original members since that time, and we’ve witnessed the tragic passing of original drummer Armando Acosta. What we haven’t seen is a return of vocalist Scott “Wino” Weinrich, and the line-up that some fans consider to be the band’s peak. The curious title comes from a particular downer that guitarist Dave Chandler enjoyed back in the day, no doubt fueling the incredible slow tempo that is at vital to this band as the sludge it hermetically seals inside each measure. For me to instruct novices to begin with Saint Vitus’ earlier catalog would be a disservice to how good Lillie: F-65 really is. Within seconds, Chandler’s guitar picks up exactly where it left off nearly two decades ago, still as primordial as ever. New drummer Vasquez speaks the same language as the late Armando, but he beats the skins in such a way that it’s tough to gauge if he’s paying tribute to his predecessor or trying to hammer nails into the coffin of his legacy. He’s heavier than Armando while unmistakably fitting into the line-up better than anyone else who may have applied for the position. Add these two forces together and you’ve got an album of such stunning aggression that you’d be forgiven if you view Sabbath’s own reunion with ambivalence. With nothing to gain, Saint Vitus seems to pride itself on proving how little they’ve moved their metal glacier from its original placement and how even the most rudimentary arrangements can reign as the heaviest element on metal’s periodic table. The album’s last two selections serve as the highlight of this wonderfully brief effort. At only a hair over a half-hour, “Dependence” is a seven-minute cautionary tale of excess, complete with over two minutes of ear-damaging feedback to drive back anyone hoping for a bit of compromise. The next song takes it even further, doing away with any resemblance of melody and ignoring any need for lyrics. “Withdrawal” is nothing more than two of layers of Chandler’s feedback, one of which pans back and forth between channels like a turret gun aiming for survivors. 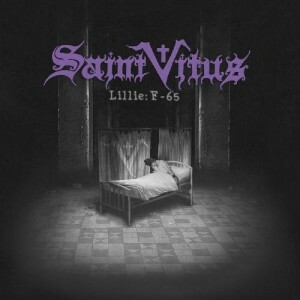 There aren’t any, when it comes down to it, except for the members of Saint Vitus themselves who not only survive, but add to their legacy with Lillie: F-65. What is remarkable is how they do it: tapping into the fountain of youth of the same formula that once had them labeled as born too late. nice review , but………..the guitarist is named …Dave CHANDLER not Alexander oops on you ! Corrected. I was listening to The Stooges’ Fun House while writing this review. Thank you.